The My Makeup Life series asks beauty biz insiders, bloggers, makeup mavens and artists to share their holy grail products, tricks, tips and favorite beauty tools. Is there anyone you would like to see featured in My Makeup Life or questions you think I should ask? Let me know here. Location: Southern California in the U.S. Stef lives in Joshua Tree and Tyna lives in Los Angeles. Day job/current gig: STEF: I’m the editor of a magazine aimed at military spouses, and Tyna is a manager at Top Tier Social Media. Current favorite product: STEF: Sorry, they’re limited edition MAC products! Tyna’s go-to blush this summer is The Perfect Cheek from the Marilyn Monroe collection. And I’m loving Feel My Pulse Lipstick topped with Underdressed Lipglass from Temperature Rising. Beauty inspirations: STEF: We find beauty inspiration in the same places we find life inspiration — old Hollywood, punk rock girls, artesian cocktails, the desert, great shoes, luxury packaging, cityscapes, the French Riviera in the 1920s, playing dress-up, animals and every gorgeous nail polish that has touched our nails. What makeup/beauty products can’t you live without? STEF: The one product that is on both of our must have lists is MAC Pressed Blot Powder. Tyna’s skin borders on dry and I’m super oily, but we both rely on it to diminish shine without getting cakey. When did you start getting into makeup? STEF: Though my dolls always got sharpie makeovers and choppy haircuts, my beauty addiction swung into high gear in 9th grade when I discovered my Mom’s mega eye shadow palette with every shade of the rainbow. I painted Adam Ant-esque stripes on one eye and never looked back! What’s your best beauty time-saving trick? TYNA: To save time when trying to cover a large pimple and shave some time off of the lifespan of said pimple, I take a few minutes to apply ice before putting on makeup. Wrap a cube in a washcloth and hold it against the pimple for 1 minute. The ice will reduce the inflammation and redness, making it much easier to hide. What’s your favorite beauty tool? STEF: My favorite is also the cheapest — the e.l.f. Small Smudge Brush. At only $3 a pop, I buy these by the dozen. I color code the handles with a stripe of nail polish and have one devoted to each liner/shadow shade (brown, black, green, etc.). The small dense bristles are also good for concealer and lip liner too. It’s the only brush I’m guaranteed to use every day. What’s the best beauty advice you ever received? TYNA: Treat your neck and dÃ©colletage the same way you do your face. The neck is one of the first areas to show signs of aging, and the entire “portrait” area is what people notice first. So don’t stop at your chin when going through your beauty routine; wash, moisturize, tone and treat the whole area. STEF: The only constants are Kiehl’s Calendula Toner and Dr. Dennis Gross Alpha Beta Peel. They’re joined by an ever-changing supporting cast of products! In the a.m., I use only the toner followed by eye cream and moisturizer. In the p.m., I use cleanser, eye cream and serum. I exfoliate with the Alpha Beta Peel 1-2 times per week. One of the newest products I’ve fallen for is Orlane Super-Moisturizing Light Cream. What’s the weirdest thing you’ve tried in the name of beauty? STEF: My stint with a home microdermabrasion machine (pretty much a miniature sander) didn’t end well. It was totally my fault, but I got a bit too vigorous and made my skin bleed! Do you have a trademark look (hair/styling/makeup)? TYNA: Bangs. I have what I think is a large forehead (a five-head, if you will) so I’ve had bangs in some form or another (long bangs, short bangs, choppy bangs, side-swept bangs) my whole life. STEF: In 8th grade I gave myself DIY highlights with tin foil and a Tide powder mixture because I thought it’s what I saw them use in the salon. I fried my hair, but it was squeaky clean! 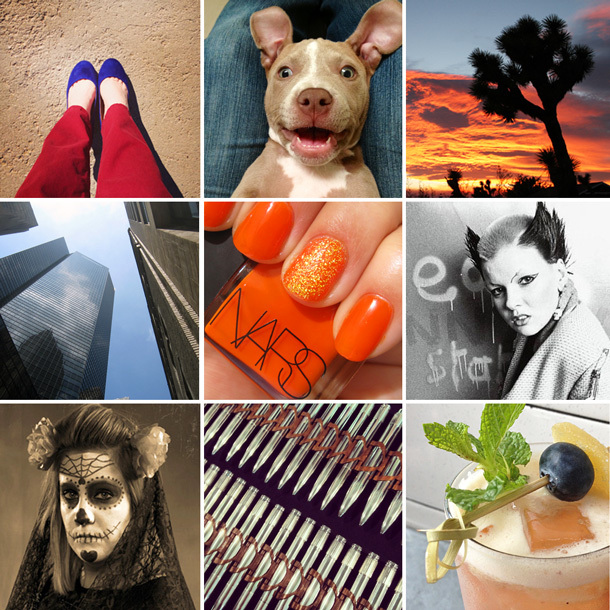 TYNA: Blue Mercury, Shopbop, Sephora, Target, H&M, Etsy, and vintage stores. STEF: We’ve been BFFs since 6th grade, and we started we heart this together so that we could share our obsessions — beauty, DIY, entertaining and more — with a larger audience than just each other. Previous Post: The New NARS Adult Content Blush Palette Is Rated Rawwwrr! Great tip about the Neck and dÃ©colletage! I tend to ignore them and I can already see the skin looking duller and more tanned compared to my face! Ankita@corallista recently posted … Deborah Milano Haul! I just recently discovered Blue Mercury and I’m in love! Glad to see you enjoy it too 🙂 We’re looking to get a dog in the next couple months and we’d love to rescue a Boston Terrier. Mabel is adorable in her outfit! Love that store too, btw. I could happily spend all day in their perfume section. Blue Mercury is an addictive place! Boston’s are such a great breed, funny and smart. 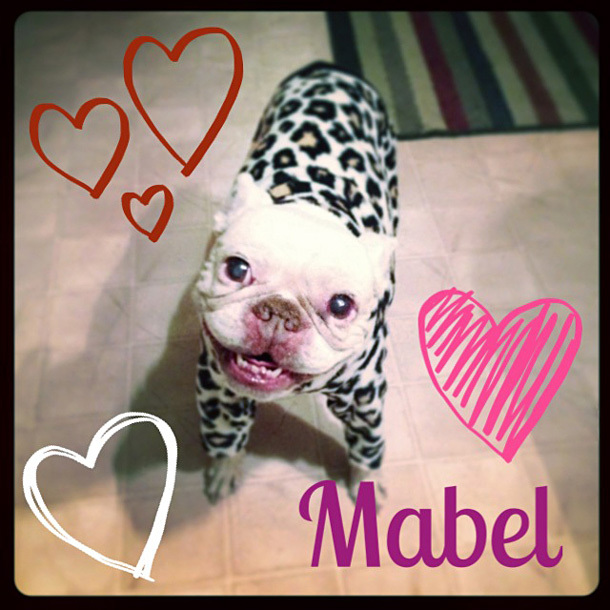 Mabel is a total ham and the sweetest girl ever. You absolutely should get one! i’ve been reading each blog you’ve featured. You’re welcome, Camille. 🙂 Glad you’re able to get some beauty reading in. This was very interesting! Aw, I want a friend I can do a blog with. Stef and Tyna you ladies have a new follower here. Thanks Pamela – It was really fun to share all this. Big shout out to Karen for asking us! What a cool duo! I love those pictures from back in the day, hee hee 🙂 Great interview! Aww, thanks! Our friendship has covered quite a few different beauty and fashion eras, lots of them very embarrasing. I HEART Stef, Tyna and Mabel! Great Q&A, I learned a few new things about you two even though I’ve been friends with you for a few years now 🙂 yay! Thanks for stopping by and sharing the love Amanda! 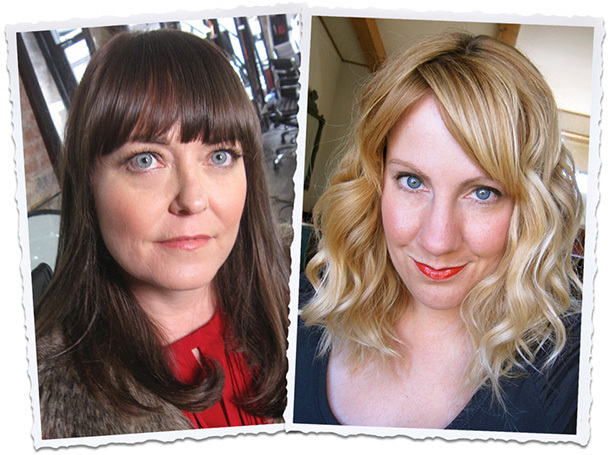 What a great piece on Stef and Tyna, who have become my own personal beauty inspirations. we heart this is endlessly entertaining, and they are pretty much the coolest girls on earth! We Heart This is such a wonderful beauty community! Tyna and Stef really know their stuff!! I think that anyone can see from this interview that they are dynamite!! Thank you Kellie – we’re excited to be included in this series. I’m definitely going to pick up one of those Elf smudge brushes! I’m with you Tyna on the bangs, I’ve worn them myself for many years. I read you guys before but now I’m going to follow your blog regularly. Mabel is cute in that outfit, looks like she’s ready to play! Pick up several of the e.l.f. brush Denise – you’ll be really happy you did! Mabel always gets cold in the winter. So she literally danced the first time I put these jammies on her. I want a people version, they’re so cozy looking! I just love MY MAKEUP LIFE! I am a huge fan of We Heart This. It is always a fun read of all types of makeup, skincare, recipes from all perspectives. Tyna and Stef are a class act all the way. I really enjoyed reading your perspectives and advice, and I hope you aren’t upset that Mabel was my favorite part! I have 2 Boston Terrier (terrors?) girls that I love beyond reason. Mabel is a cutie! I understand, Mabel dominates everything she touches! I have two Bostons too, my other one is Ted. Great dogs, aren’t they? Mabel is awesome! And I too love the Elf small smudge brush (it is the best crease and eyeliner smudging brush ever!). I only have one though. I am totally stealing your idea and getting more and color coding them. It would definitely make my mornings quicker. I too need to pay better attention to my neck. Oh, Mabel…!!! Very sweet interview, thank you! This series is so great. Keep it going! I loves me some Stef and Tyna! I also now loves me some Mabel. Like, I might put that picture of her rocking her sassy jammies in my Christmas cards this year. Great stuff, very interesting. Mabel is so cute but who is the other cute little puppy in the montage? That’s Lola, a pibble pup at the Humane Society I volunteer at. I’m happy to say she got a home!